A whistleblower (whistle-blower or whistle blower) is a person who exposes any kind of information or activity that is deemed illegal, dishonest, or not correct within an organization that is either private or public. The information of alleged wrongdoing can be classified in many ways: violation of company policy/rules, law, regulation, or threat to public interest/national security, as well as fraud, and corruption. Those who become whistleblowers can choose to bring information or allegations to surface either internally or externally. Internally, a whistleblower can bring his/her accusations to the attention of other people within the accused organization. Externally, a whistleblower can bring allegations to light by contacting a third party outside of an accused organization. He/She can reach out to the media, government, law enforcement, or those who are concerned. Whistleblowers also face stiff reprisal/retaliation from those who are accused or alleged of wrongdoing. Third-party groups like Wikileaks and others offer protection to whistleblowers, but that protection can only go so far. Whistleblowers face legal action, criminal charges, social stigma, and termination from any position, office, or job. Two other classifications of whistleblowing are private and public. The classifications relate to the type of organizations someone chooses to whistle-blow on: private sector, or public sector. Both can have different results that depend on many factors. However, whistleblowing in the public sector organization is more likely to result in federal felony charges and jail-time. A whistleblower who chooses to accuse a private sector organization or agency is more likely to face termination and legal and civil charges. Deeper questions and theories of whistleblowing and why people choose to do so can be studied through an ethical approach. 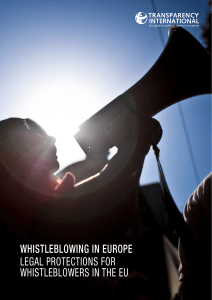 Whistleblowing is truly an entirely ethical decision, and action. In the case of many like Edward Snowden, whistleblowing is seen as the last ethically right thing to do. Legal protection can also be granted to protect whistleblowers, but that protection is subject to many stipulations. Hundreds of laws grant protection to whistleblowers, but stipulations can easily cloud that protection and leave whistleblowers vulnerable to retaliation and legal trouble. Whistleblowing is not a new phenomenon. In fact it is thousands of years old. However, the decision and action has become far more complicated with recent advancements in technology and communication.Whistleblowers frequently face reprisal, sometimes at the hands of the organization or group which they have accused, sometimes from related organizations, and sometimes under law. Questions about the legitimacy of whistleblowing, the moral responsibility of whistleblowing, and the appraisal of the institutions of whistleblowing are part of the field of political ethics.